Wow, it’s really exciting times to see a car like the new BMW i8 actually becoming a reality and able to be bought and used on our public roads. This is a huge step forward in the history of the sports car, and having an exciting machine available with cutting edge electric technology like what is in the BMW i8 shows us where the future of the cars on our roads are heading. With an incredible drag co-efficient of just 0.26, the minimum wind resistance is aided by the new i8 having a fully concealed underbody which prevents wind turbulence under the car. The i8 also has aero-flaps to improve the aerodynamics of the wheel arches and side sills behind the front wheels. The BMW i8 is all about conserving energy and reducing wind resistance for the ultimate green sports car experience. The new BMW i8 also pioneers the processing of carbon fibres and their recycling. Each BMW i8 has carbon fibre bodywork, not only for superior weight reduction but also for strength. Carbo fibre materials can be recycled and channelled back into the production process when the time comes. Inside the BMW i8 is a very smart interior that looks amazing and is made of natural, renewable, and sustainable materials. The new BMW i8 features door trim panels and dashboards made from a renewable natural fibre, naturally-tanned leather and an open-pore eucalyptus wood. To keep the i8 cutting edge, luxurious and comfortable, there are numerous features. Cruise control with an auto braking function, automatic 2-zone air-conditioning, keyless access to the vehicle, the front seats have electric four-way adjustment, Voice Control, Bluetooth communications, Head-Up Display, and a premium harman/kardon surround sound system with 11 speakers. At the centre of the console is the iDrive touch controller, and the high-resolution 10.25-inch colour display is striking and boasts a quick-start function. 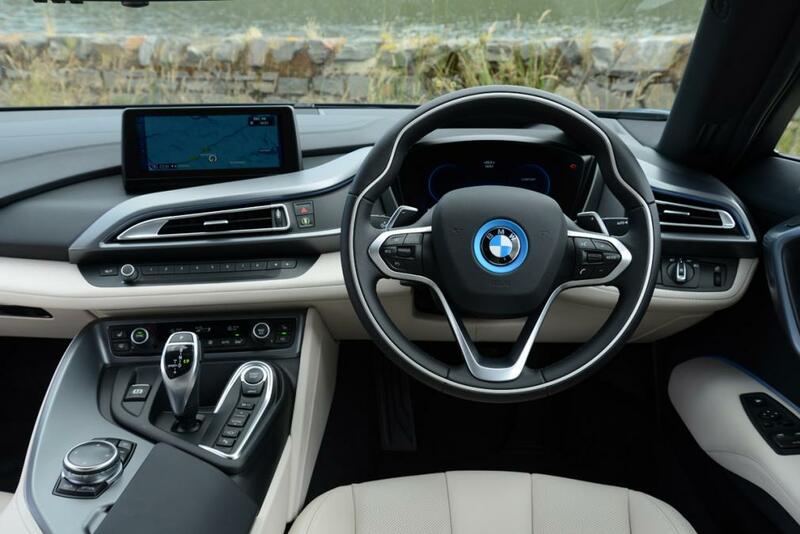 You certainly feel in a very special and exotic machine when you drive the new BMW i8. To get yourself underway, the keyless entry works a treat, and the gullwing doors open up and out to provide easy access into the i8’s low bucket seats. The start button is pushed and the electronic dash lights up. There are five modes to select for your drive, and the sport mode is the mode that uses the front electric motor, a turbo-charged 1.5-liter petrol engine and also another small electric motor. All three working in unison provides a total of 266 kW of grunt and 570 Nm of torque which is enough to send you flying from a standstill to 100 km/h in around 4.0 seconds. The six-speed automatic transmission drives the rear wheels, while a two-speed automatic transmission powers the front wheels. The driver can override the six-speed auto via the paddle shift gears on the steering wheel. The BMW i8 is fast and exciting to drive, and the AWD cornering is intense. A governed top speed of 255 km/h has you truly flying. 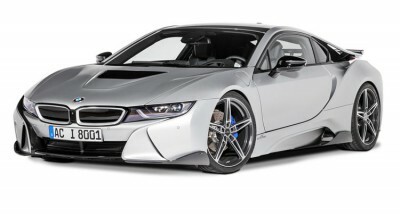 It would be interesting to see what the i8 could do without the limiter, but that’s just me being a kid. One of the treats when fully opened out is the engines gorgeous raw notes, however, when in economy mode or normal mode, the occasional whir of the electric motors is all you’ll hear. To look at, the new BMW i8 is one of those cars that just looks right from the word go. A long wheelbase, short overhangs and a very low-slung roofline gives the car a look of speed, and I think it’s right up there with one of the best sports car designs on the road. There is enough detailing and cool air scoops to make it look awesome, and the LED day lights are eye-catching. The front nose is low and wide, with the prominent double kidney grill at the forefront. Safety has always been part of the overall i8 packaging, and the design team have even thought of the pedestrians or cyclists nearby who won’t hear the car’s all electric motor modes. The team have equipped the BMW i8 with an artificially generated sound when driving electrically up to 30km/h to protect other road users. Front airbags for driver and front passenger, side airbags for driver and front passenger, and for those occupants in there rear there are head airbags. The BMW i8 comes with integrated roll-over sensor and battery switch-off function in the event of a serious accident. Dynamic Stability Control (DSC), an antilock braking system (ABS), Brake Assist and Cornering Brake Control (CBC) are standard active safety features. Large 20-inch BMW i light-alloy wheels, a carbon-fibre reinforced plastic (CFRP) passenger shell and a tyre pressure indicator are also standard features. The rear view camera and Park Distance Control (PDC) makes slipping in and out of tight places easy. BMW i8 excitement is infectious, and with a car as good as this, you’ll have all the ‘Wahoo’ experiences you’ll need to last a life time! For any more information on the BMW i8 or, for that matter, any other new car, contact one of our friendly consultants on 1300 303 181. If you’d like some fleet discount pricing (yes even for private buyers! ), we can submit vehicle quote requests out to our national network of BMW dealers and come back with pricing within 24 hours. Private Fleet – car buying made easy!